This is it. It’s been brewing for months, but I’ve finally gotten around to writing this post comparing U.K. and Canadian Smarties candy. Enjoy! You learn strange things when you start asking questions. It was during a visit to British Pantry, Calgary’s most delightful U.K. import shop, that I noticed a small selection of British Easter sweets, including Cadbury Crème Eggs. Being naturally inquisitive, I asked one of the staffers if they were different than the Canadian Cadbury Crème Eggs I was used to. Heavens yes, they told me. For one, they’re made with British milk chocolate, which is, they assured me, quite different than – and far superior to – North American milk chocolate. While they couldn’t quite explain what made it so much better, it was hard to argue with their huge selection of U.K.-made import versions of readily available Canadian chocolate bars. A dedicated audience of chocolate aficionados was clearly willing to pay a premium for the U.K. version of a candy you could buy at 7-Eleven. Intrigued, I went home and did some digging on the interwebs, which is where I found this quite technical explanation from a chocolatier on Quora that outlined the differences. As much as I found the distinction on paper (well, screen) interesting, I wanted to try a side-by-side test of British chocolate and Canadian chocolate, just for the hell of it. By then, Crème Eggs were out of season, so I picked a local favourite: Smarties. British Pantry had some fresh U.K. boxes in stock, while my local Safeway had an ample supply of domestic Smarties. Several hundred calories later, here’s what I learned. 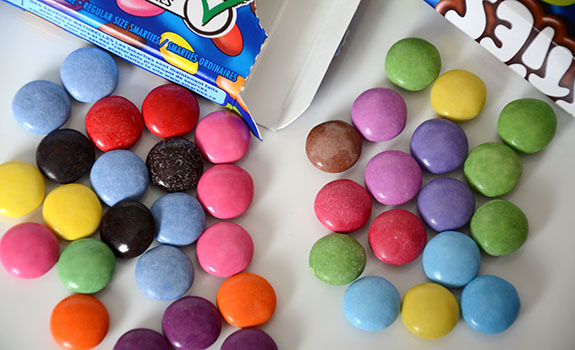 Canadian Smarties, left, are a bit more intense in their colouring than British Smarties. The British Smarties have a more pastel set of hues. 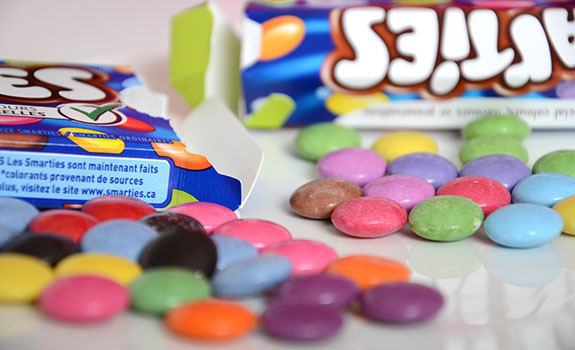 Packaging: Canuck Smarties? Plain rectangular cardboard box. Basic, yet functional. U.K. Smarties? Crazy six-sided cylinder with a flip-top opening. Eye-catching, certainly. Heads will turn when you bring out one of these at the office. ADVANTAGE: U.K.
Package Size: The Canadian box is clearly labelled 50 g. Bafflingly, the U.K. box doesn’t mention how much it weighs at all. While you could theoretically extrapolate the weight based on the nutritional information panel (if half a tube is allegedly 89 calories and 100 g equals 469 calories, then … ), that’s too much work for something that should be automatically provided. I weighted the contents on my kitchen scale and came up with 36 g. ADVANTAGE: Canada, due to value/size as well as clarity in labelling. Cost: I bought my Canadian Smarties for $1.10 at the grocery store. A box of U.K. Smarties costs $2.29 at the local British import shop. Pretty big difference. ADVANTAGE: Canada. Availability: Smarties are everywhere in Canada. British Smarties, on the other hand, are nearly impossible to find. ADVANTAGE: Canada (based on my living in Canada, obviously). Nutrition: (Warning: This is going to get complicated.) The Canadian box is easy thanks to a clear label. In 50 g (one box), there are 230 calories, 7 g of fat, 25 mg of sodium, 2 g of fibre and 2 g of protein. The same 50 g quantity of U.K. Smarties (not the actual box size), based on the data provided for 100 g, would yield 235 calories, 8.8 g of fat, and 2 g of protein (sodium and fibre are not given). So, slightly more fatty than the Canadian ones. Because you know you don’t want to do the math yourself, each tube (by my 36 g measurement) would contain roughly 169 calories, 6.3 g of fat and 1.4 g of protein. ADVANTAGE: Canada, again for clarity. The Look: Canadian Smarties are flatter than British Smarties, and the coatings are more vivid and less pastel. Both claim to have no artificial colours, though there’s an asterisk on the Canadian package that leads nowhere (whoops?). ADVANTAGE: Draw. Taste: The flavour is not the same. Canadian Smarties, to my mind, taste like Canadian Smarties. They have a colouring/sweet flavour from the coating, followed by an almost hot-chocolate-powder chocolate taste. The British Smarties are creamier, with some notes of orange that you don’t get in the Canadian version. Unfortunately, through my repeated purchases of boxes of British Smarties over the past year or so (we’re big on research at NEAROF!, let me tell you), I kept getting rogue Smarties that tasted stale – almost freezer-burned – and generally nasty. (Before I get inundated by perturbed, beautifully eloquent letters of reprimand from British readers, note that the best before date on these is January 2014, and I’m eating them on July 1, 2013.) ADVANTAGE: I’m totally biased, yes, but I prefer the taste of Canadian Smarties, and they’re consistent. Verdict: Maybe U.K. Smarties are a taste of home for Brits living in Canada, but honestly, I really do think Canadian Smarties are superior. They taste more chocolaty without the staleness, and they’re far cheaper to buy here than U.K. Smarties. Even if cost wasn’t a factor, I’d still prefer the Canadian variety. Another shot of U.K. and Canadian Smarties candy. As you can see, the British Smarties are a tad plumper than their counterpart from the colonies. The debate being about milk chocolate would only really be relevant to Cadbury chocolate. Their dairy milk chocolate is made with real milk in the uk, whereas in Canada it is made with powdered milk. This makes the texture different. UK dairy milk is so much nicer. They both sound dreadful but I love them. Canadian ones are better overall but the UK orange ones actually taste like orange, which is a lovely surprise. You missed the fact that all the different colours of UK smarties are different flavours while the Canadian version is just one flavour of candy shell. While I am Canadian born; no I do not eat the red ones last as I personally do not like their flavour so I eat them first and the others after. On to UK Smarties…try eating each colour together and you will find they each have a unique flavour. I am told yellow is banana although I find the flavour a tad obscure. When eaten in lots of individual colours, I was able to taste a difference although not identifiable. Purple is apparently blackcurrant as the Brits shudder at the thought of grape flavouring. When chucking them in your mouth as a mixed lot, the taste is not always appealing and may have given the stale taste. I definitely prefer the price of Canadian Smarties but would eat either if placed in front of me. Was born in England, moved to Canada 30 years ago when I was 12, and since then have frequently received resupplies on all the essential stuff from England and/or British food shops. Years ago, English chocolate was noticeably superior to Canadian – cases in point: Mars Bars, Bounty Bars, Cadbury Creme Eggs. But over the years, we’d bring some back or have some brought back for us, and we’d say “Hmm.. doesn’t taste like they used to”. Perhaps 10 years ago, I did a head-to-head comparison on all 3 with their Canadian counterparts and … surprise surprise, found we now actually preferred the Canadian versions of all 3. On one hand, one becomes accustomed to what one knows – on the other hand, the actual ingredient lists of the UK products have changed over the years so the products are not the same as we remembered: milk powder instead of real milk or cream, soy lecithin instead of ?? and various other substitutions usually made for economic (profitability) reasons. My aunt moved from Britain to Australia around the same time we moved here, and she agrees with us 100%, having noticed the same thing herself. Local Cadbury Creme Eggs also shrunk in size over the years and we swear the yolk/albumen’s taste also changed – the fondant is far too sweet and is flavourless (though we can’t say that it had a specific flavour, we agree it had a taste, now it’s just sugar). The UK chocolate also shell also changed in recent years, so now they’re both not worth buying. For the first time in our lives, Easter goes by without us buying them. Haven’t had Smarties in years, but I do remember that back in the day, another England-based aunt prohibited her children from eating certain colours due to fears about a certain food colouring. 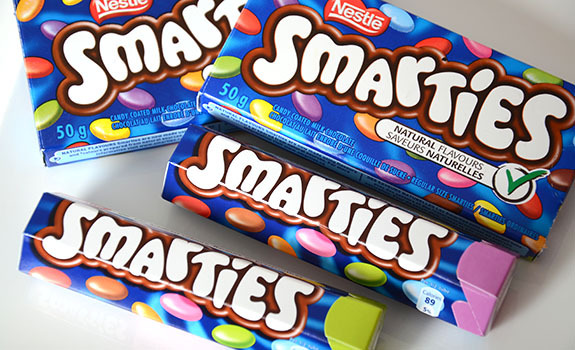 I certainly don’t remember coming to Canada and ever thinking “the Smarties here are different”, so if today they are more pastel coloured in the UK than Canada, I’m inclined to say that’s a (relatively) recent thing.